I want to start this post off by saying that this Challenge in particular is difficult for me to put into words. Every challenge is different and difficult in its own way, and most give you a few things that you think you can’t do. The biggest challenge of this one was pushing through when every part of you wants to quit. We found the start point, chatted with old and new friends, and managed to get into rough formation before the two Cadre arrived. Welcome party was reasonably straightforward, calisthenics, bear crawls, and being reminded of the importance of following commands quickly. Interesting new feature was a skull drag, keeping the body as low as possible and crawling while dragging the ruck. We then were assigned team leaders, given extra gear to carry (two 80-100 pound sandbags and Cadre Rage’s swim fins), given a location to reach and a time hack, and we were off. We made the destination within the time limit, were given a short break while our team leads got instruction from Cadre, and off moving again. I tried to take a turn under the sandbags, but found that I could not keep pace with the rest of the team while carrying it, and had to switch out. Shortly thereafter one of the team left formation without a buddy and became a casualty. And soon we gained a log and telephone pole that would be our constant companions for the next several hours. These set a new standard for brutal carries. For the first hour or so (?) I was up front switching out under the casualty and team weights. The short-but-stout log was being carried by a group of guys much taller than me, so I didn’t have a chance to cycle in. At some point we got the call to hold up because the group with the telephone pole had gotten too far behind. I grabbed a teammate and went back to see if I could help. I arrived just as Cadre was explaining to the group that carriers need to be roughly in order of their height, or the weight crushes the tall people. We started calling out our heights to see where we fit in, got the pole up and moving. It went well for awhile, but then problems started to crop up of needing to go back under as soon as you had gotten out or of no one coming when you called for a replacement. Every few minutes we got the call of ” 1, 2, 3 UP! !” to try to get the pole back up to shoulder height, as it kept crushing us beneath it. We got the order to put the log down, take 5 minutes, and get something to eat. Then back up and more of the same. On previous challenges, it was common to adjust your height under the log by sort of getting under it and jamming your pack against it. When I tried that here, someone behind me pointed out that we might well lose control of the log and not be able to get me out in time, so I went back to putting a shoulder under it and adjusting as best I could. We hit a point where the “123 UP!” was becoming continuous, and the damn thing just wouldn’t stay up. For the first time in any of the challenges I have done, we put the log down without orders. We had given all we could, and trying to carry it further would lead to us dropping it and the chance of someone getting hurt. We stood there a few moments, staring at the log and wondering what we could do from here. Cadre looked us over, saw that we had given all we could, and told us to kick the pole into the ditch and catch up with the group ahead of us. At the next stop the remaining log broke in two, so we again had two teams carrying. The new team lead told me to basically manage one of the teams, getting replacements for them when needed and making sure we roughly stayed with the group. We finally were permitted to get rid of these logs as well, and moved on to our next point with only the weights we had started out with. It was about this point that the pace the Cadre required started to wear down on me and a few of the others. We ended up marching down the side of the interstate, and it was all I could do to keep moving. When we finally got off the interstate, we formed up and rested for a few minutes. Cadre talked to us, explained that he knew we were tired, knew we were sore, but what really matters is pushing on from this point. Continue marching a few more miles, and we are told to take off and pack up our “snivel gear,” meaning gloves and jackets. Most of us knew what that meant: it was maybe a degree above freezing, and we were fixing to get wet. We moved on, went through or over a fence to a little beach by the lake, and formed up for instructions. We were divided into two groups, and had to nominate one of the group to learn everyone’s name. Success meant staying dry, failure meant going out to rib-height, going completely under the water, and sugar-cookies on the beach. We made a good go at it, but yeah, we failed. We got our gear back on and moved out. My leg muscles were locking up from the cold, and I was hobbling along. Cadre ordered those of us who were limping to go to the front of the line to set the pace, so I went with them. I had to fall out to fix my shoe awhile later, so I ended up back somewhere in the middle of the line. My muscles warmed a bit from the movement, and the pace of the group was doable at this point. When calls came from the front of the line to get people to take 30-second cycles under the sandbags, I thought what the hell, I’ll give it a try. Flaw in my reasoning was that while I could keep up with the group at this point, I could not move fast enough to move up in formation to where the weights were. The moment when I realized this may have been the lowest point of the entire challenge. We failed to get everyone across an intersection before the signal changed, and those left on the other side became casualties. I took a ruck from one of them, but I didn’t have enough left to buddy carry (at least not at any kind of pace). We made it back to our start point and formed up for Cadre to speak. The detail that sticks out for me was when he asked who had considered quitting, and I raised my hand along with maybe a quarter of the class. He thanked us for having the moral courage to admit that we had come close to giving up. But 72 teammates, 12-1/2 hours, 19-20 miles, no one dropped out. I had intended to also do the Light that started a few hours later, but my body was too beaten up. I dropped by to deliver the team weight and flag and watched the welcome party, but did not complete it with them. I’m still too slow, and in particular I am too slow under load. Need to work on this. Need to prep my gear further in advance. Some of my problems along the way could have been fixed by rigging my gear differently, and some of the gear that I brought didn’t work as expected. I took a few days after this to relax and reflect, then back to training. I have more of these in the coming months, and while I was not the burden on the team that I feared being, I was also not the asset to the team that I want to be. Posted on April 9, 2016 by themonkofthemud. Bookmark the permalink. Just wanted to say I found your blog this winter and read through all the past entries. 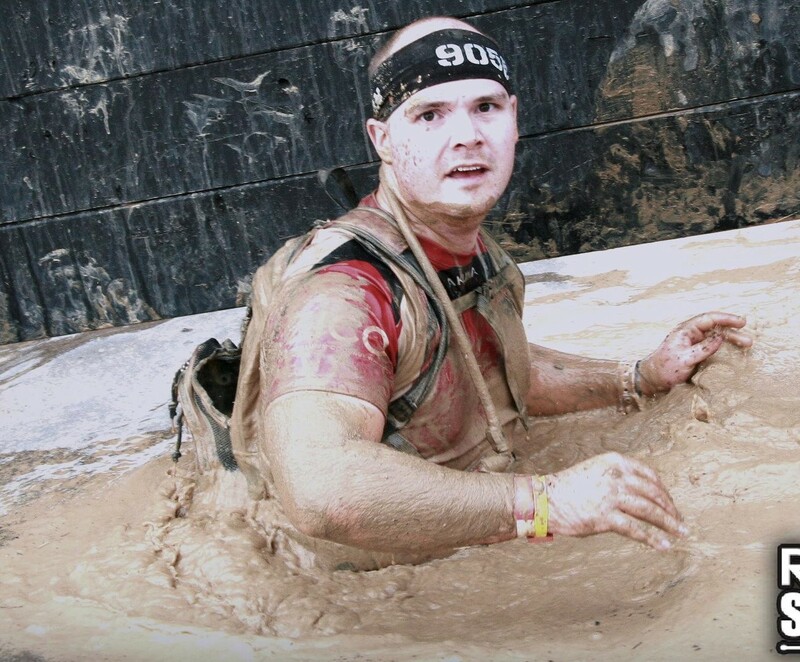 I was considering doing an OCR, but wasn’t sure, and your writing, experiences, and attitude was the tipping point for me. I just completed my first OCR this past weekend (Gladiator Assault Challenge in Boone, Iowa) and loved it. Thanks for sharing and keep pushing yourself! Thank you, that is the best complement that you could have given me. Congrats on your finish,and I hope to see you on the course at some point!